In the preceding post, on the greenhouse effect, I investigated the role of the greenhouse effect and its play in radiative balance, and how the presence of an atmosphere acts to raise planetary temperatures. The take home points should be that for a planet with no infrared absorbing layer above the surface, the fourth power of the surface temperature always approximates a value determined by the incoming solar radiation. The only way the surface temperatures can exceed this value is if there is an atmosphere which acts to be a blanket to outgoing radiation. A planet can also be heated by internal processes such as radioactive decay or rigorous convections from the mantle, but these are rather negligible on the terrestrial planets. Adding greenhouse gases to an atmosphere whose temperature decreases with height must act to warm the surface by making the net downward emission greater than zero. In this post, I will elaborate on specific greenhouse gases, the runaway greenhouse effect, and an antigreenhouse effect. The effect that a greenhouse gas has on temperature has to do with its concentration, where it absorbs and where the planet emits radiation, as well as the overlap with other gases. For example, ozone is a greenhouse gas and closes the atmosphere to the transmition of longwave radiation between 9 and 9.7 μm. Because the bandwidth or window at which ozone absorbs radiation is closed, additions of ozone have very little effect on its absorptivity in the atmosphere. CFC’s on the other hand occupy a virtually open window to longwave transmission between 8 and 13 μm, and so their effect is much greater. On a molecule-by-molecule basis, it may be a a thousand times greater than carbon dioxide, but CFC’s are measured in parts per trillion and so overall exerts a rather small effect. Adding gases to places where outgoing radiation freely escapes has more of an impact that enhancing absorption where there is already some. The gases degree of “saturation” is also relevant; it is often remarked that methane is more powerful than CO2, but this is not due to some intrinsic property of the gas, but precisely because methane exists in lower concentrations and so has yet to fill its primary bands. If methane existed in higher concentrations than CO2, the reverse would be true: CO2 would be more powerful on a molecule-by-molecule basis. Adding a gas against lower background concentrations will have more of an effect than adding it against higher background concentrations as the absorption spreads away from the peak. Carbon Dioxide is not yet saturated, but its absorption effects do go up logarithmically rather than linearly for this reason (which is a good thing, as the climate would be overly sensitive to small changes otherwise). To act as a greenhouse gas the molecule must possess a dipole moment, or some of its vibrational motions must create a temporary dipole moment. This eliminates homonuclear diatomic molecules (O2, N2) as being able to interact with the infrared. A dipole moment of a molecule is the product of the charge and the distance between the charge. Gases are not rigid stick figures like in high school chemistry class, but are constantly in motion and are vibrating. The molecules we are discussing in the atmosphere have no net charge (i.e., they are neutral) but they may have localized charges. Consider how water has localized areas of positive (hydrogen) and negative (oxygen), and so individual molecules tend to stick to one another. The diatomic molecule vibrations are very symmetric, and so the center of mass, and of charge, of the system is not displaced during vibration. This is not true when you have three molecules, as the center of charge moves as the molecule vibrates, creating a dipole moment. For carbon dioxide, you can have a symmetric vibration (this acts like the diatomic molecules and so is not infrared active), but you can also have the asymmetric fashion, in which one bond shortens while the other lengthens. There is also the bending mode, and different vibrations correspond to absorption at different wavelengths. As is the well known case for CO2, infrared radiation at 667 cm-1 (15.00 μm) excites these vibrations. Greenhouse molecules are capable of absorbing passing infrared photons; the energy of the photon is converted into an excited vibrational state of the GHG molecule. As I mentioned, the molecules often have more than one vibrational mode that allows them to absorb IR photons of more than one wavelength. Diatomic molecules have a set of energy levels associated with the oscillation caused by pulling the nuclei apart and allowing them to spring back. The infrared light provides a fluctuating electric and magnetic field which alters the molecule’s environment. This displaces the nuclei and electron cloud, and excites vibration or rotation. For a molecule to be a good infrared absorber and emitter, its molecular motions must couple strongly to the electromagnetic field. The two-atom molecules are too tightly bound together to vibrate and thus they do not absorb heat and contribute to the greenhouse effect. Absorption of energy by a particular gas occurs when the frequency of the electromagnetic radiation is that of the molecular vibrational frequency of the gas in question. Gas molecules collect radiation by their vibrational energy states, forming bands through rotational splitting. The absorption windows are formed by the averaging of a series of narrow bands. If these bands are still partially open, then absorptivity will increase linearly as the gas concentration increases. If the band is saturated, then the gas will begin to enhance absorption at the edges of the band (or band wings). It is often noted (as I did above) that the diatomic molecules cannot behave as greenhouse gases. However, this does not hold true for many planetary atmosphere cases, such as when the atmosphere is sufficiently dense and collision induced absorption becomes a significant factor. This arises with the collision complex formed by two molecules in the act of colliding; when there are frequent collisions, such as on Titan (Saturn’s largest moon) and on all the giant gas planets, diatomic molecules acquire enough of a dipole moment during the time collisions are taking place such that the electromagnetic field can interact with their transitions. This is a true collisional continuum, and doesn’t come from broadened lines. Because of this pressure-induced opacity, N2 and H2 are strong greenhouse gases on Titan, and H2 on the giant planets. On Titan, collisions between N2-N2, CH4-N2, and H2-N2 are responsible for its greenhouse effect (McCay et al., 1991, Science 253: 1118-1121). This effect plays out big in denser atmospheres, but not a factor on Earth. Now if radiation had to have exactly the wavelength of the discrete spectral lines there would not be much interaction between the radiation and the molecules because there is such a small probability of the radiation having exactly that wavelength. As it turns out, the motion of the molecules themselves alter this spectrum, and the collisions between molecules in the atmosphere affect absorption as well. Doppler Broadening arises because of the fact that a molecule moving towards a light source will see the frequency shifted to higher values, and a molecule moving away the frequency will be shifted to lower values. When you average over all possible directions of molecular motion, this turns out to be Gaussian (i.e., the normal bell-shaped curve), and so the distribution of the frequencies of the absorbed radiation also is Gaussian. Of more importance to planetary atmosphere is pressure induced broadening. The absorption lines become narrower as pressure goes down, and most of the spectrum is in between lines and so the absorption coefficient changes as a function of atmospheric pressure. This means that the pressure broadening in an atmosphere forces the absorption to spread to a wider range of frequencies/wavelengths. Titan is kept warmer than it would be otherwise by the greenhouse effect of its thick atmosphere, but it is also unique to the solar system in that it has an “antigreenhouse effect.” The greenhouse effect there is more powerful than the antigreenhouse effect, and so the net effect is warming, but the moon would still be over 20 K warmer if you removed the cooling component. The upper atmosphere of Titan carries a “haze layer” of organic compounds which blocks a large part of the incoming radiation, and stops it from warming the surface. Just the opposite of the traditional greenhouse effect in planetary climates, this haze layer is opaque to incoming solar radiation, but transparent to outgoing infrared radiation. This provides comparison to the kind of cooling produced by particles thrown into the stratosphere from volcanic eruptions. The antigreenhouse effect on Titan reduces the surface temperature by 9 K whereas its greenhouse effect increases it by 21 K. The net effect is that the surface temperature (94 K) is 12 K warmer than the effective temperature (82 K) which would be set by just incoming solar radiation and no atmosphere. When an upper layer that is opaque to shortwave radiation is added, the region of the atmosphere below this layer will become more isothermal. The infrared opacity of the lower atmosphere now loses its strength since the greenhouse effect needs a lapse rate, and the surface becomes colder. Removing the haze layer on Titan would result in more transmission of incoming solar radiation, and enhance the tropospheric greenhouse effect, and so to cause much higher temperatures there. The O3 in Earth’s stratosphere serves as a very minor antigreenhouse effect, but it only absorbs a tiny fraction of the incident radiation from the sun– in the UV. Insofar as water vapor is a powerful greenhouse gas, the tendency for water vapor content to increase with temperature will amplify the warming caused by CO2. It is often remarked on the internet that water vapor is the most powerful greenhouse gas, and overwhelms carbon dioxide. Somehow, a claim that states that 95% of the greenhouse effect is due to water vapor has made its rounds, but this is clearly erroneous, and is more like 2/3 Water Vapor to 1/3 carbon dioxide (see Kiehl and Trenberth 1997 ). It is however true (see their table 3 for instance) that most infrared absorption is from water vapor, with carbon dioxide in second place. Of the 33 K greenhouse effect, about 10-11 K is due to well-mixed greenhouse gases (ones that do not precipitate out from the atmosphere for the typical range of atmospheric temperatures). This means that if we had no water vapor, but kept the other trace gases constant, the temperatures would be roughly 10-11 K above the baseline 255 K set by Stefan-Boltzmann. The influence of clouds and water vapor closes the gap, so it is quite obvious that it is important (no water vapor = snowball earth), but it is also obvious that the other gases are extremely important, and removing them would generate a similar icehouse. Carbon Dioxide is by far the most important of those trace gases because it absorbs strongly at the peak of Earthlike emission (water vapor absorption is weak here) dominating the 15 micron emission region, and exists in much higher concentrations than the other gases. Even still, this is a bit misleading. As some may have picked up on, water vapor is generally treated differently than the other trace gases, and sometimes ignored in talking about forcing effects of various agents on global warming. This is because the well-mixed gases have concentrations determined by their addition and removal from the atmosphere. In the case of carbon dioxide, its concentration is regulated by the balance between sources and sinks. Some of the other gases such as Nitrous Oxide or CFC’s may be destroyed chemically. Water Vapor on the other hand, is set by temperature and circulation patterns (which turn out to keep the atmosphere subsaturated). That means that by raising or lowering temperatures, the water vapor influence follows along, with the saturation vapor pressure set by the Clausius-Clapeyron relationship (further discussion on water vapor feedback here, here, and at realclimate. This means two important things: First, the influence of water vapor on the 33 K greenhouse effect is directly tied to the presence of the other gases, as if you removed them and lowered the temperature by 10-11K, you would also lose the water vapor influence and so the global temperatures would close in on the -18 K baseline. In that sense, one can say the water vapor influence depends on carbon dioxide being in the atmosphere. The other point, is that raising temperatures (e.g. by adding CO2, increasing solar irradiance, etc) will also cause the water vapor content to increase and lead to amplification. This is a positive feedback, and acts to raise climate sensitivity. Water Vapor is not a climate forcing agent, but rather a climate feedback, further pushing the system in the direction that some initial push gave it. Carbon Dioxide is a necessary component for the explanations of what is going on in many past climates. The Archaean, Cretaceous, and other hothouse periods involved very high CO2 concentrations, while icehouse climates involve very low CO2 concentrations. The gas is also shown to force the climate into new states, such as outgassing aiding the snowball earth back to livable conditions, or forcing rapid warming during the Paleocene Eocene Thermal Maximum. CO2 is also an important player in the coming and going of the glacial cycles over the last million years, mainly serving as a feedback to temperature changes but providing the push necessary for a self sustaining ice age or interglacial period. The gas is also very important on Venus, and without it, the planet would be colder than Earth…but instead, is the hottest planet in the solar system. At the most intense end of the water vapor feedback, one can get a runaway greenhouse effect. This is an unstable feedback loop that doesn’t end until the entire ocean is evaporated into the atmosphere, and the water breaks down into hydrogen and oxygen from the high energy solar radiation, and the hydrogen escapes to space while the oxygen reacts with rocks. This means that CO2 cannot turn into limestone and the outgassed CO2 stays in the atmosphere. Earth and Venus have nearly the same amount of carbon dioxide, but on Earth most of it is locked up into rock and carbon sinks, while on Venus it is in the atmosphere. The CO2 present in carbonate rocks on Earth is around 60 bars (Kasting and Ackerman 1986; Science 234 (4782): 1383). This is sixty times the current total atmospheric pressure. The very early Earth had a much fainter sun than today (~25-30% reduced solar output), but the Earth was still much hotter, largely due to the fact that CO2 was present at much higher concentrations and we had a denser atmosphere. In fact, a 10 to 20 bar carbon dioxide atmosphere may have existed during the first several hundred million years of the earth’s history which could give it a surface temperature near water’s boiling point. On Earth, we have an important geophysical modulator of CO2 concentrations. Too much carbon dioxide causes acid rain that dissolves calcium through the weathering of igneous bedrock. Calcium-rich water can flow into the oceans where it is used by organisms to build calcium carbonate skeletons. When they die, skeletal material settles and accumulates on the ocean floor. Because of plate tectonics, the ocean floor moves outwards from ocean ridges to be consumed by the Earth’s mantle at subduction zones. Calcium Carbonate also moves along, is subducted into the mantle, releases carbon dioxide in magma, and may be released through volcanoes. Without water however, such as on present day Venus, it is impossible for carbon dioxide to dissolve and form acid rain. The carbon dioxide accumulated in the atmosphere over time through planetary degassing, but with no oceans and biomass, there are no carbon sinks and so it stays in the atmosphere. The early atmospheres on Earth and Venus were rather similar, but Venus was just a bit closer to the sun such that the carbon-bearing compounds evaporated rather than remaining in the rocks. When you increase the concentration of CO2 you reduce the slope of the line in the below figure. In the same way, the positive water vapor feedback causes the slope of emission vs. T become to be more linear than T4 (see below figure). The ability of water vapor to enhance climate sensitivity is shown as the temperature rise from b to b’ becomes much larger than the change from a to a’ (in the dry case) with the same forcing from increased solar irradiance. The OLR curve then flattens out with very high sensitivity. In that sense, the planet’s temperature is not determined purely from Stefan-Boltzmann, but from the OLR with the temperature profile, CO2, water vapor, etc. Here, the figure shows the equilibrium outgoing long wave radiation at the top of the atmosphere with various assumptions on the carbon dioxide concentration and the relative humidity. In this figure, at around 320 W/m2 the OLR curve flattens out from very high climate sensitivity, which demonstrates that a limit exists in terms of how much a planet can lose energy. 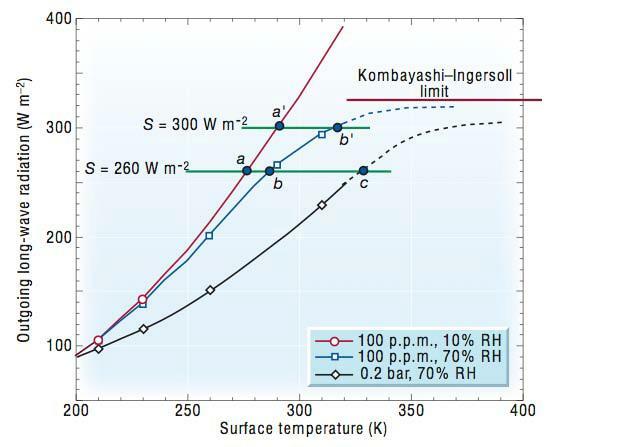 This limit is referred to as the Kombayashi-Ingersoll limit. If the net incoming solar radiation exceeds this limit, then the result will be a runaway greenhouse effect. As it turns out, this limit is influenced by the mass of the atmosphere, and high surface gravity increases the Kombayashi-Ingersoll limit making it harder for a runaway greenhouse to occur. When the temperatures exceed that at which the ocean has become depleted, the OLR can once again rise with temperature as the mass of the atmosphere remains constant, and the planet can then achieve radiative equilibrium but at a temperature greater than the ocean evaporation point. This is basically what happened on Venus, and the solar radiation was just enough to push Venus into a runaway state. This is not a situation that can occur on Earth today, except for maybe in billions of years when the sun becomes much brighter. Today, the planet is heated nearly entirely by back radiation and is exceedingly hot from its dense atmosphere and high greenhouse concentrations. Although it is closer to the sun now, it receives much less solar radiation at the surface than Earth because of its extremely thick cloud cover (i.e. a very high albedo). Venus’ temperature with no greenhouse would actually be colder than the Earth with no greenhouse because of the very little sunlight (~ 17 W/m2 averaged on the surface). The clouds also serve in the greenhouse effect, where sulfuric acid clouds reflect outgoing IR (unlike on Earth where clouds absorb and re-emit) but they can inhibit cooling to space that way. On net though, the clouds are a cooling agent on Venus. There is actually some trace amounts of water vapor on Venus which contributes to the greenhouse effect, but CO2 is the largest contributor. The atmosphere is so opaque in the infrared that less than 1% of the outgoing infrared actually escapes. This entry was posted in scientific basis, what is global warming?. Bookmark the permalink. I have thoroughly enjoyed reading this very informative and fascinating article on the greenhouse effect. Though I am a scientist, not iin the field of climatology, but am reasonably well familiar with the issues involved. Your article was a real education for me, and I would appreciate similar articles sent to me directly. has written “Runaway greenhouse theories contradict energy balance equations” based upon a finite semi-transparent atmospheric model, and that the generally accepted semi-infinite atmospheric models are outdated. I understand that the October, 2006 paper was “peer reviewed” and published in Quarterly Journal of the Hungarian Meteorological Service. Response– Yet a runaway there was on Venus. Magic. A runaway effect on Earth is just a strawman, as no one seriously claims the current threat from adding CO2 is a “runaway greenhouse.” My particular issues on my quick glance at this paper is that, computing the atmosphere as a single column (you cannot do that, see Pt. 1), over emphasis on the surface energy budget (it is the imbalance at the TOA that matters), and wild assumptions that are not supported by the literature– for example, that water vapor should decrease as CO2 is added. “For example, in case the increased CO2 is compensated by reduced H2O, then the general circulation has to re-adjust itself to maintain the meridional energy flow with less water vapor available. This could increase the global average rain rate and speed up the global water cycle resulting in a more dynamical climate, but still the energy balance equations do not allow the average surface temperature to rise.”… Whaaaat?????? Another example of runaway greenhouse effect, sort-of, is provided by the “Snowball Earth” episodes of the past. Both going into snowball mode — a negative runaway, triggered by albedo sensitivity of continental ice sheets extending to 45 degs latitude — and coming out of it, a positive runaway putting the whole Earth into a global wet tropical hothouse state for a while afterwards. Wouldn’t more warming also change clouds by increasing evaporation, and more clouds cause cooling? I think it would take a lot to get a runaway effect. From what I understand the snowball Earth “un-iced” because of CO2 degassing and nothing could go back into rocks/ocean because they were frozen, and so it accumulated in the atmosphere. Michael, yes, that’s basically correct. Actually because there was no precipitation, rock weathering didn’t work, but volcanic outgassing of CO2 just continued. A contributing effect could also be volcanic dust settling on the white snow, reducing the albedo (and no new snow covering it). > would take a lot to get a runaway effect. No, clouds form when _relative_ humidity exceeds 100%. Evaporation increases, yes, and _absolute_ water vapour content increases, but under the commonly made approximation that global circulation patterns don’t change, both the relative humidity distribution of the Earth atmosphere, and the places within the system where clouds can form, will remain the same. The clouds will contain more water, but as they are opaque anyway, that shouldn’t make any difference. This doesn’t necessarily apply though to the highest, thin (ice crystal) clouds, and there has been much discussion on what their net effect would be. But you’re right that it takes a lot for a runaway greenhouse effect to happen. Actually it is not true that clouds form only in saturated air. Most droplets form on condensation nuclei (microscopic dust or salt particles) and this occurs at lower than 100% saturation. Actually, according to works of Ray Pierrehumbert, the snowball Earth cannot be “un-iced” by any amount of CO2 in atmosphere, even 20% would not do un-icing. Go figure. Though it doesn’t rank with the Bernie Madhoff’s Ponzi scheme, it is nonetheless criminal at a time when important decisions are about to be made that will affect our way of living and economic well-being. According to a NOAA Press Release yesterday, NCDC’s ranking of 2008 as ninth warmest if expected trends continue compares to a similar ranking of ninth warmest based on an analysis by NASA’s Goddard Institute for Space Studies. The NASA analysis indicates that the January-November global temperature was 0.76 degree F (0.42 degree C) above the 20th century mean. The NOAA and NASA analyses differ slightly in methodology, but both use data from NOAA’s National Climatic Data Center – the federal government’s official source for climate data. Don’t believe a word of it. UAH MSU satellite data suggest 2008 will end up about the 15th warmest (16th coldest) in their 30 years of lower tropospheric data. The NASA, NOAA and Hadley data bases are seriously contaminated and the agencies are intentionally ignoring the issues as they are agenda driven with inflated budgets because of the alleged global warming. NOAA has actually gone as far as to pull out the urbanization (urban heat island or UHI) adjustment from the US data and there is very little to no urban adjustment made to the global data based on the flawed papers by Peterson and Parker which suggest UHI has little effect on global trends. Ignored are the many other papers from some of the worlds best climatologists worldwide that suggest it produces significant contamination. Add to that the fact that more than 2/3rds of the world’s stations (most rural) have dropped out and or are often missing monthly data, 69% of the first nearly 600 US stations evaluated by Anthony Watts surface stations.org are poor or very poorly sited with only 4% meeting official standards and no changes were made for the known biases of new instrumentation. Not less than half a dozen peer reviewed papers have suggested the warming is exaggerated by up to 50%. This would put 2008 somewhere nearer the middle of the pack of the 114+ years in the global data bases not near the top. It also belies the claim that the 10 warmest years have occurred in the last dozen years. Read more here on the important data integrity issue. Accuweather.com The global warming blog. Does anybody know if there has been any practical application of the greenhouse effect, for example to increase the temperature in an oven? Do you have any references that I could look up (text book or journal papers) about how non-symmetrical molecular vibrations are the root cause of the greenhouse effect? I have heard about this before, but I have not yet found a good reference about it as most books that talk about global warming don’t go that far deep into why it happens. In fact this is how I can across your informative post – searching for more info on this effect! Here, I think Bert Sprockett is arguing that CO2 can’t contribute to global warming because CO2 molecules only hold IR for milliseconds, and the effect diminishes at higher altitudes. At 1:45am I’m not totally able to internalise your Greenhouse Gas blogs; but based on what I understand so far, he’s barking up the wrong tree – or just barking (i.e. not as in mad, but as in barking seems to be a classic AGWD response). If I understand your blogs at least partially, it doesn’t matter that IR radiative energy absorbed by CO2 is transferred to the other molecules, because the net effect is already known…. Surely what this means is: CO2 absorbed radiation is passed to O2 and N2 which makes them move faster… in other words he’s saying that CO2 absorbed radiation heats the atmosphere! So, that’s crazy – he’s just described atmospheric warming due to CO2 whilst denying the connection. I’d advise you to mug up on the basics of atmospheric radiation heat transfer. You can do this easily by reading the standard text ‘Atmospheric Radiation’ by Goody and Yung, OUP, 1989, pages 30-41. You might then understand the non-equilibrium processes going on in the troposphere and avoid glib comments. As a non-physicist, I can only partly understand the arguments for and against the possible existence of a CO2-induced atmospheric greenhouse effect. Clearly, however, there is serious scientific debate about its existence (and I would encourage more of it). Can anyone refer me to other physicists’ attacks against the Gerlich-Tscheuschner contention?